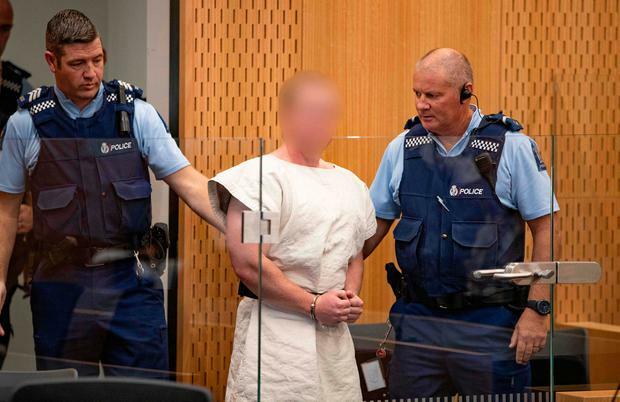 The man charged with murder in New Zealand, following the killing of 50 people at two separate mosques in Christchurch, described himself online as "a private and mostly introverted person" from "a regular family". The reaction of Brenton Tarrant's friends was equally predictable. "I honestly can't believe that somebody I have... shared conversations and interacted with would be capable of something to this extreme," said one woman who worked with him. Another who knew him as a child described him as "angelic". That would be consistent with what is known about radicalisation. Inadequate individuals in search of meaning in their lives are led down a dark path. Brenton Tarrant haunted the shadowy recesses of the internet, where the discontented gather to vent their multiple hostilities. For most, it's a harmless release valve. For others, it sets them on a course to destructive action. "I decided to take a stand," was how Tarrant described his decision to commit mass murder in the hope of sparking a race war. He took it to the logical end by streaming the massacre in real time on the internet, creating a digital Ouroboros, as the serpent that eats its own tail is known in mythology. Radicalised by the internet, he finally uses it to spread the word, thereby radicalising others in an endless cycle. At least that's what he hoped. Becoming his own broadcaster meant that Brenton Tarrant could bypass mainstream media, while still being able to control it by providing the material to fuel the story in the immediate aftermath. It ensured that Tarrant's audience was not confined to like-minded acolytes. Anyone who uses social media cannot avoid being exposed as well. Whether it's just tweeting supportive hashtags for victims, or discussing who or what was to blame for inspiring the violence - because everyone seems to have an opinion about that, and it invariably chimes conveniently with their existing political prejudices - we all become part of the killer's game. That's the dark genius of the internet. It connects the world, and it turns out that this may not always be a good thing. Some things and some people should be kept far apart. That concern is echoed by Tim Berners-Lee, the man who invented the world wide web 30 years ago. He concedes that, for all its potential to enrich daily life, it has also "given a voice to those who spread hatred and made all kinds of crime easier to commit". Berners-Lee remains optimistic about the next 30 years, but such fears can only be intensified by Christchurch. Tarrant's manifesto will now have been seen millions of times. Most will give up in contemptuous despair a few pages in. A few will be thrilled by what they find there, and a few is all it takes to keep his "ethno nationalist, eco fascist" message alive. There is probably no way of preventing the internet being used for these malign ends, at least not in ways that might not in themselves become equally dangerous. That is one of the difficulties of the conversation around this subject, especially when atrocities such as the massacre in New Zealand occur, making rational consideration well nigh impossible. It always starts from the premise that something has "gone wrong" with the internet. But what if nothing has gone wrong with it? What if Tarrant was simply using the possibilities inherent in the medium by its very nature? Every technology is corrupted soon after birth. The printing press led to the dissemination of propaganda, too. Photography, radio, TV, cinema - all were quickly exploited for mass manipulation, and continue to be so. No technology is innocent. In broadcasting his killing spree live to the world, Brenton Tarrant was not doing anything new. He was merely adapting the instruments that are used by "influencers" everywhere, from celebrities on Instagram to content providers on YouTube. It's all about getting the attention of an easily distracted world, then keeping it. Mass shootings, like beheading videos posted by Isil, are a gruesome but effective way of doing that. Social media companies cannot prevent live footage of such acts appearing on their platforms, but they have undoubtedly been leaden-footed about ensuring that it doesn't get constantly uploaded and replicated like a virus. Videos of Brenton Tarrant carrying out the mosque shootings were gone from Twitter within hours, but they're still out there, one click away. If there is anything to be said for the concentration of power in a few giant corporations, which has allowed them to amass huge amounts of information on each and every one of us, it is that it must be easier to regulate a way to shut down dangerous content - however that is defined. Ultimately, though, it is not possible to find a way of blocking white supremacists' access to the internet without first understanding why this technology has wormed its way so deeply into our collective consciousness. The effects are only gradually being mapped. Marshall McLuhan, who coined the famous phrase "the medium is the message", noted that reading requires concentration, whereas TV encouraged passive consumption. The internet, which is far from passive, goes one step further, relentlessly bombarding the brain with stimuli in short bursts that leave one both eager for more but also psychologically anxious. MRI scans show the effect to be similar to addiction. It is known to affect memory; deferring gratification becomes harder; productivity at school and work decreases accordingly. Some say we shouldn't worry about it, because the brain evolved to focus in fragments. That's all very well, but the internet now fires more of these shards at us than evolution ever expected. It's little wonder that our minds struggle to cope with the deluge of sensation. Tim Berners-Lee offers one astonishing statistic: "There are more web pages than there are neurons in your brain." To put it another way: we're outnumbered, and the battle is only going to get more uneven. Throwing an increasingly toxic, atomised politics into the mix is a recipe for ever greater, and stranger, extremism. Without doubt, there will be more Brenton Tarrants. Some will come from the right, some from the left, but they will all be children of the world wide web, whose impulse to kill for a muddled cause goes hand in hand with a desire for notoriety and attention, becoming ever more difficult to tell apart. The internet didn't invent violence, but it will increasingly shape the form in which it is transmitted and consumed. The only decision left is whether to keep watching.